Ruth over at Pippin Sequim posted a great tutorial on Orange Peel quilting. She demonstrated how to do it at our last BAMQG meeting. The National Quilt Museum in Paducah, Kentucky will host an exhibit called Themes and Variations in Judy Martin’s Quilts, featuring 25 of Judy’s quilts. It will run from December 12, 2012 to March 11, 2013. I love her quilts and most of her books (recent ones have been too project based for me) because the designs are unique and interesting and her directions are impeccable. Go see the show and report back if you are in the neighborhood. 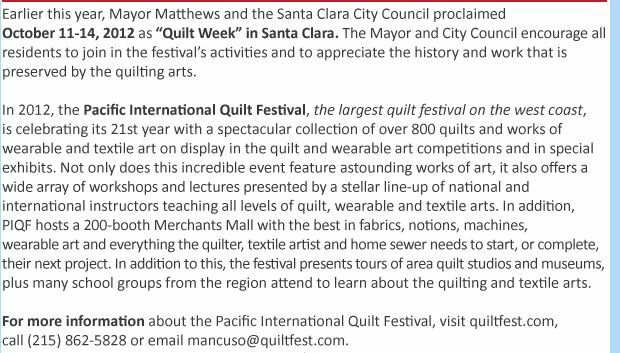 Remember a while ago I went on a bit about the Modern Quilt Movement and what it meant? One of the students wrote her thesis on this issue for the University of Nebraska (presumably at Lincoln?). Read it and let me know what you think. The San Jose Museum exceeded their fundraising goal by raising over $46,000 at their most recent event. 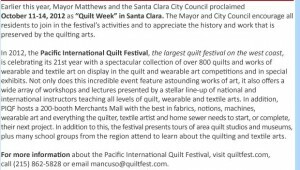 Due to a small deficit at the end of their fiscal year, the Board of Directors of the San Jose Museum of Quilts and Textiles has unanimously voted to close the Museum on Tuesdays beginning October 1st . This closure is in addition to the long standing Monday closure. They said that it was not an easy decision and they will be cutting some overhead costs, and allowing existing staff to focus on programs and services to enhance our outstanding exhibition schedule and other Museum activities. The board charged the new Executive Director to analyze our resources and it was decided that the Museum was over-extended by being in operation for six days a week. The Board has made no decision as to how long this Tuesday closing will be in effect. The Board hopes that their supporters and community members will continue to visit Wednesday through Sunday, from 10am to 5pm beginning October 1. Any questions or concerns should be directed to Christine Jeffers, who can be reached through the website. My friend, Kathy, over at Bliss Habits is hosting a book group using The Artist’s Way by Julia Cameron as part of her Bliss Habits Book Club. Chel Micheline, of Ginger Blue Studio and Tuesday with Chel on Bliss Habits will be the hostess. She writes about the concept of the book group for this book in a blog post from a week or so ago.